OHMSSDBS.com » We need your help! Please DONATE HERE! We need your help! Please DONATE HERE! 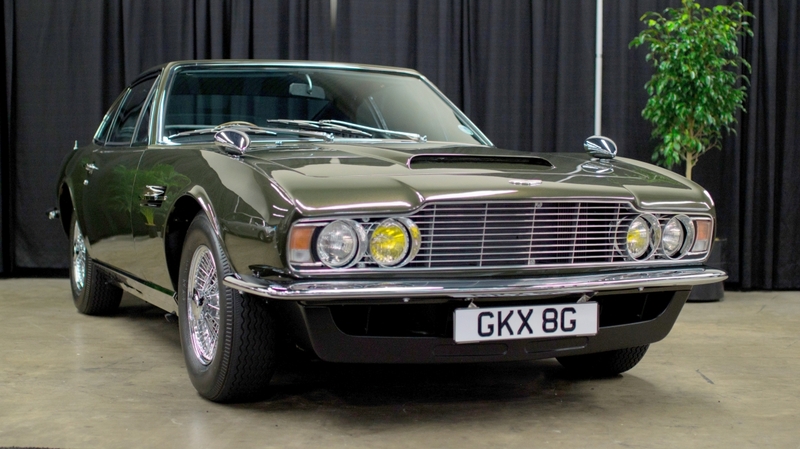 A childhood dream turned into a lifelong love affair with this James Bond 1969 Aston Martin DBS, to “On Her Majesty’s Secret Service” specification. I had restored her over a 3 year period, then shared this elegant and important piece of film history with the world, winning several concours events, and, more importantly, doing charity, fundraising, and public outreach programmes, where the DBS is a crowd pleasing star! Unfortunately, in January of 2016, thieves broke into a Public Storage unit where she was temporarily kept, as the building she was normally housed in was undergoing major repairs. The callous vandals stole all of my tools, many of which were collected over 25 years, and many NOS, and hard to find parts. They bounced parts off the top of the car, damaging nearly every panel,and creased in the right side, while squeezing out my rolling tool box. The most unkindest cut of all was the insurance company’s nightmare estimator, who denied payment for basic items and a proper repair. I need your help to restore Her Majesty’s DBS and preserve this Aston Martin for future generations. I have over 1000 hours of my own, and several thousand dollars in materials so far, but my skills and wallet can only go so far. I need to employ a metal finisher, and painter. Please contribute, so I can continue to help others with this beloved, cherished piece of our heritage. Welcome to OHMSSDBS.com, a site dedicated to the homage restoration of the 1969 Aston Martin DBS from the James Bond film “On Her Majesty’s Secret Service,” or “OHMSS” to 007 fans worldwide. Please enjoy my website, and return often for news, updates, and progress photos of the 2016 Second Restoration. Well, it all began as a childhood dream…. I fist saw OHMSS on a double bill with “Goldfinger” at a drive in movie when I was about 7. The “new” Bond theme played- new to me as I had only one LP with music from the previous films, the tires screeched, and there was this incredible car! The new Bond was seen in mysterious lighting, as was the new Bond car. Every kid my age wanted a DB5. Most of us were lucky enough to have the Corgi version, with the oft missing figures that popped out of the spring loaded, hit-your-sister-in-the-eye-with ejector seat. This was new, this was a fresh design- this was for me! I fell in love with the car, the film, and the music. In 1976 ABC showed the film on TV, and like most others, I was appalled that they re-edited Peter Hunt’s brilliant work, added a voice that was not George Lazenby, and ruined it for many of us for years…. ….until the Stanford Theater began to show Bonds on major holidays. There it was, in the Pink Section of the SF Chronicle for Christmas Eve 1979, they were going to show OHMSS. My sister’s present to me was to drive me all the way to Stanford to see my favorite film. There was no Ebay then, nor had I ever even seen a poster of the film. Very little publicity material was out there… until we arrived at the theater, and there it was- the gorgeous poster with Bond and Tracy on skis, and even a set of lobby cards. I pleaded with the theater manager to buy the one lobby card that had only the roof line of the DBS showing- but I knew that shape, and it was enough for me! “Merry Christmas” he said as the opened the glass display, and handed the precious card to me. That night, Farrah Fawcett went to mothballs, and up went what would be many years later, my DBS. On a family trip to Disneyland, I made my parents drive me to Wallach’s Music in Hollywood, after hearing tell that they carried many show tune albums. While my father paced and smoked outside, and my sister distracted my mother with a Telly Savalas sighting, I pestered the store manager for an OHMSS LP, or anything Bond for that matter, and he “looked in the back” and appeared what felt like hours later, with an OHMSS LP and mini poster! I had $12 and a discount coupon for a pizza. Dad had to kick in another $10, and I solemnly promised to clean the windows, sweep the floor, and polish up the handle on our front door for 30 years…. Visualizing the photo of the car and watching the film wherever it would appear, the call came on a cold February morning in 2008. A DBS for sale had been located in the UK,thanks to the AMOC, and the stars aligned…. My dear friend, and Ferrari Doctor Sal Garcia and I traveled to the UK for a Bond tour, taking in many OHMSS sites, collected the DBS, and returned to San Francisco for the First Restoration at his shop, Waterfront Automobili. Many years of exciting and satisfying concours wins and events followed. In 2016, I decided to respray her, following several battle scars, and complete the transformation to film seen specification, refitting many original parts, and reshaping her to become an accurate and correct homage to the film that shaped my life in so many ways….